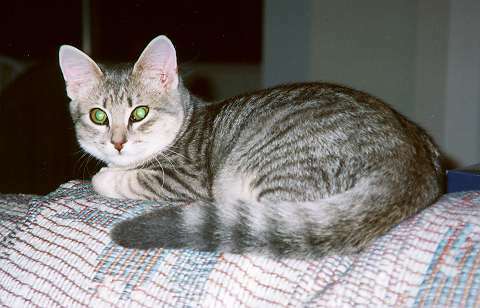 On the evening of Wednesday, Februrary 23, 2011, my cat Minnie passed away. I'm still pretty broken up about it. 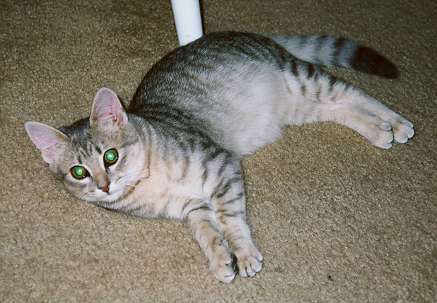 Minnie adopted me back in January of 1995 when she was just a little kitten. I still remember how I was climibing up the outside stairs to my apartment on the 3rd foor of the Highland Gardens apartments in Mountain view (on Escuela, at the end of Villa) and as I pass the second floor this little kitten jumps off the roof of the laundry kiosk and literally grabs me on the leg and starts meowing. I said "Shoo! Go away!" and kept walking up the stairs and she followed me meowing all the way. She was just a little kitten, and she looked kind of thin and hungry, so I let her in and two bowls of milk and a half a can of tuna later, she never left my side. I didn't have any kitty litter or anything so I took her for a walk so she could use the bushes. She trotted along beside me as I walked around the complex, looking so happy to have found a friend. She'd use the bushes and then continue along with me. She was very careful of all my stuff in the apartment, too. I wasn't sure I wanted a cat, just having got out on my own after getting out of grad school - wasn't sure I wanted any responsibility of any kind at that point. But then I found out where she'd come from. Turns out my downstairs neighbor had put her outside because she didn't get along with her kids or her other cat. And she'd got Minnie from her sister who'd found her somewhere but Minnie didn't get along with her or her pets, either. By this time it was very clear that this little cat really, really wanted to be with me and, in fact, didn't actually like anyone else. So, I decided I would keep her which suited her fine. I named her Minnie because I thought it would be kind of funny. She seemed small and I thought she'd be a good mouser. She turned out to be neither of those things, topping out about 12 pounds and was more interested in birds and insects rather than rodents. She could do amazing flying leaps and catch bugs between her two front paws. The problem with that was upon landing she needed her feet back to stand on and the bug would fly off. And she was no trouble at all. Cat's sleep about 16 hours a day but normally they pick inconvenient times to be awake. Not Minnie; she'd sleep at night and when I was at work and she'd be up the time I was up and home. So, she didn't get bored or keep me up. 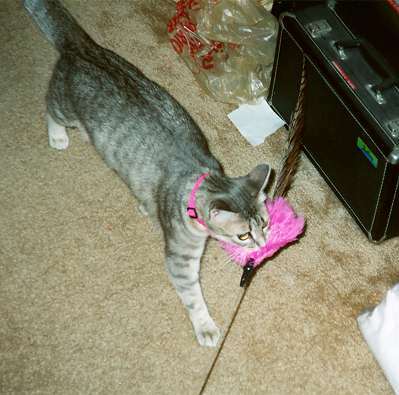 So, being a kitten, she naturally wanted to play while I was home. That was fine, I found I liked having the company. And I could dangle things for her to chase around while I watched TV or something. But if I was doing something that required more attention (like building these original webpages) I couldn't really do that. No problem, though, because I taught her to fetch! I'd thow little balls for her and she'd run down the hallway and pick them up in her mouth and bring them back to me. 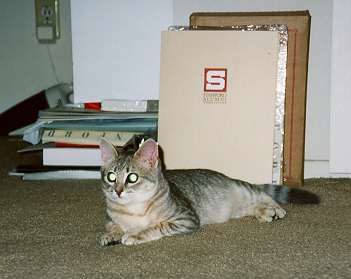 She was a very smart cat. I used to travel up to visit my family near Seattle and didn't want to leave her alone so I took her with me. She did NOT like traveling. I'd put her in a little case and take her through the airport with her growling and hissing all the way. Even while tranquilized. But she was soooo cute, little kids would see her as I walked by with her and break away from their parents and come rushing over, yelling "kittie!" and then try to poke her through the cage. I felt like the pied piper or something walking through the airport trying to keep a bunch of little kids from losing their fingers. And then once you got her on the plane she'd sit quietly for awhile and then let everyone know how loud she could really be. We're talking alarm siren loud here. So, I'd open up the little access door and try to pet her and comfort her. She considered this her que to try to get out the access door. If she managed to get a shoulder out I couldn't get her back in and would have to pull her all the way out, open the clamshell door and try to stuff her back in. Once I did that and she slipped out the other side of the case while I had the clamshell open (keep in mind it is on the floor in front of my seat in an airplane so - not a lot of room to manouver. Anyway, she made it several rows up the aisle before I caught up with her. So I grabbed her and brought her back. Keep in mind also that it is near Christmas time and everywhere is wearing thick sweaters and so Minnie is clawing at everyone's sweater as I'm trying to pull her back and I finally stuff her in the cage again as I thought I was going to get in trouble because you're not supposed to let your pet out. I only heard one person say in a puzzled voice to no one in particular, "Was that a cat?" Anyway, she mellowed out as she got older. She moved to two new houses with me and put up with my wife and two kids. She was my friend right through the end and I will always miss her. I used to say that she was probably the reincarnation of a girlfriend I'd wronged in a previous lifetime because she was always seemed kind of jealous of anyone else who paid any attention to me. Only recently did somebody point out that maybe it was somebody I'd done right by in a previous life, not somebody I'd wronged. Maybe that was true. I hope I did right by her in this lifetime. Here's the orignal section of photos of her from my original webpage. Well, this IS pretty stupid, but hey, she's the most popular thing on these pages as judged by the access list (although the Nerd Tour is catching up rapidly), so here it is; several action photos of my kitty. Besides, I have to get SOME use out of my scanner. Minnie lying on the couch. Minnie lying on the floor. Minnie lying in front of some folders. Minnie proudly carrying her favorite toy which she just wrestled away from me. Minnie sitting on some shelves. 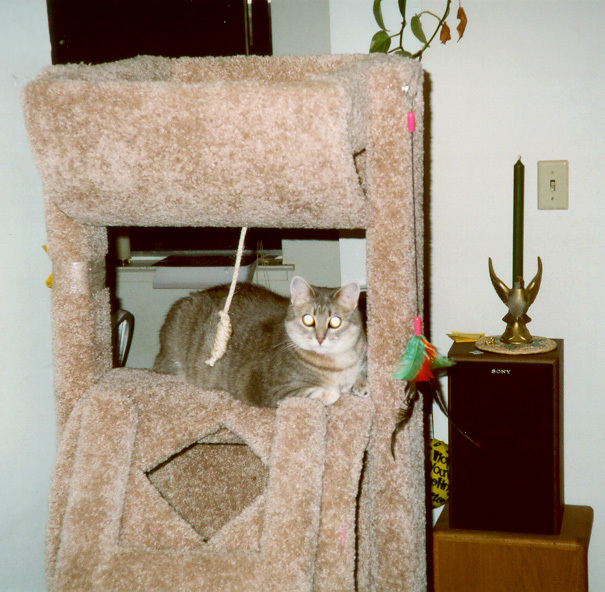 Minnie sitting on the Big Cat Climber.